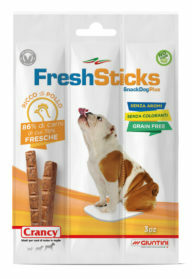 Crancy SnackBone is a complementary food Small-Medium for breed of dogs. All dogs need to chew dry snacks to help them have strong, healthy teeth. 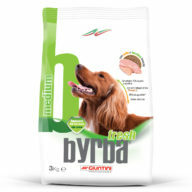 At the end of a run or after exercise Crancy Snackbone are the correct reward for your dog. Remember to leave plenty of fresh water available in a separate dish. 1 bone per day in addition to the daily meal. Crancy Snackbone cannot replace a complete food for your dog. Cereals, Meat and animal derivatives (dehydrated Chicken meat and hydrolyzate chicken 5%, Gelatine 2%), Derivatives of vegetable origin (Crude fibre concentrate from natural lignocellulose 7%), Minerals, Oils and fats, Vegetables (infra red micronised peas 3%), Yeasts. Moist: 16,0%; Crude protein: 19,0%; Crude oils and fats: 3,0%; Crude fibres: 6,0%; Crude ash: 10,0%; Calcium: 0,9%; Phosphorus: 0,4%. Vitamin A: 1.400 I.U./kg; Vitamin D3: 90 I.U./kg; Vitamin E: 28 mg/kg; E1 Iron: 683 mg/kg; E2 Iodine: 0,05 mg/kg; E4 Copper: 0,7 mg/kg; E5 Manganese: 3 mg/kg; E6 Zinc: 2,5 mg/kg. Antioxidants, Preservatives, 1m558i Bentonite: 6%.